Tired of the same ole' chicken? We'll show you how to flavor it with some spices and coconut milk, then watch as a "boring" chicken, becomes a "scoring" chicken. 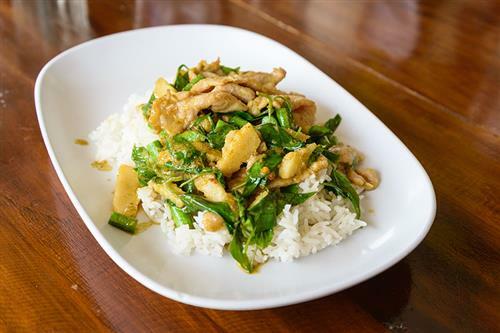 Coconut chicken is an island classic that'll have you coming back for seconds every time! Coconut Chicken is a classic Caribbean dish that's also popular in some Asian cuisines. It's a tasty way to add a Jamaican twist to an old classic. This delicious chicken recipe goes great with rice & Callaloo. Enjoy! Season chicken breast with JCS Chicken Seasoning and JCS Garlic, Escallion & Allspice. In a large skillet, fry chicken breast in vegetable oil until chicken just begins to brown. Stir onions, green & red bell peppers into the skillet with the chicken. Saute onions, green & red bell peppers until almost fully cooked, then stir in garlic and CEG Spicy Honey Garlic Sauce and stir. Add JCS coconut milk. Let the mixture cook for 5-10 mins. before removing skillet from heat. If desired, add JCS Hot Pepper Sauce. Transfer the mixture to a 9 x 13 inch baking dish. Bake at 390 degrees for 25mins or until fully cooked. Best served with rice. Enjoy!